VARTA AGM powersports batteries come fully charged and ready to ride. They are factory activated, permanently sealed, maintenance-free and certified NONSPILLABLE, so they can be mounted at any angle. Click on image for more specifications. The VARTA Powersports AGM battery is designed with extreme conditions in mind, so you always have maximum power with no loss in performance. The battery resists vibration, is certified NONSPILLABLE, so it mounts at any angle, and is permanently sealed and maintenance-free. Quality built battery terminals reduce corrosion and prevent acid leakage, ensuring the battery lasts longer. Valve regulated venting system releases gas in case of a pressure build-up, in a safe and controlled manner. Cell connectors join the individual battery cells together, via the plate block, creating a shorter energy path and increasing starting power. The extra-strong case has special oil-resistant plastic that is molded to remain stable in extreme temperaturas and rugged terrain. Specialized grid design creates optimum conductivity and high-resistance to vibration – essential when you're riding off-road. Advanced Absorbent Glass Mat (AGM) separators absorbs the acid evenly in the battery, providing high cycle stability. What does the Absorbent Glass Mat (AGM) do in VARTA Batteries? The special absorbent glass mat soaks up all the acid in the battery, providing high cyclic stability. This enables the battery to be repeatedly charged and discharged without any loss of performance. This is why our battery functions so well as an AGM motorcycle battery, or in other powersports applications. Confidence with every twist of your wrist. Motorcycle types are as different as the bikers who ride them, from cruising and touring to sport riding, racing and off-road. Yet all motorcycle models have something in common – riders who demand dependable performance from a motorcycle battery in a variety of conditions. And, of course, most riders would rather be out on the road than home waiting for a battery to charge. VARTA AGM batteries come fully charged, direct from the factory, so you can get right to riding. Hard revving, long-running Factory Activated AGM motorcycle batteries by VARTA are the smart choice for today’s riders. No measuring, pouring or initial charge required. 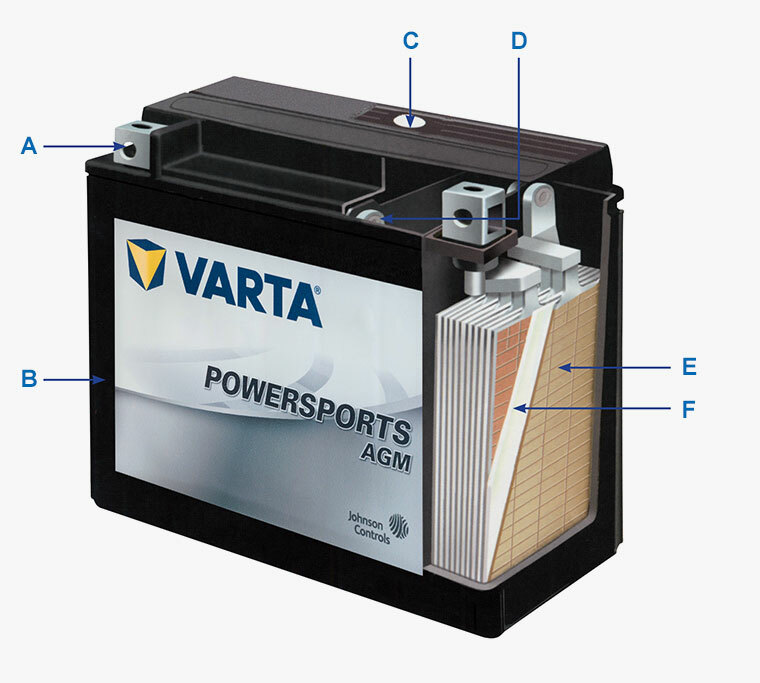 VARTA AGM batteries come precision charged and permanently sealed from the factory. They are ready to be installed and ready to power your engine immediately out of the box. This is a huge advantage over traditional “dry-charge” batteries.